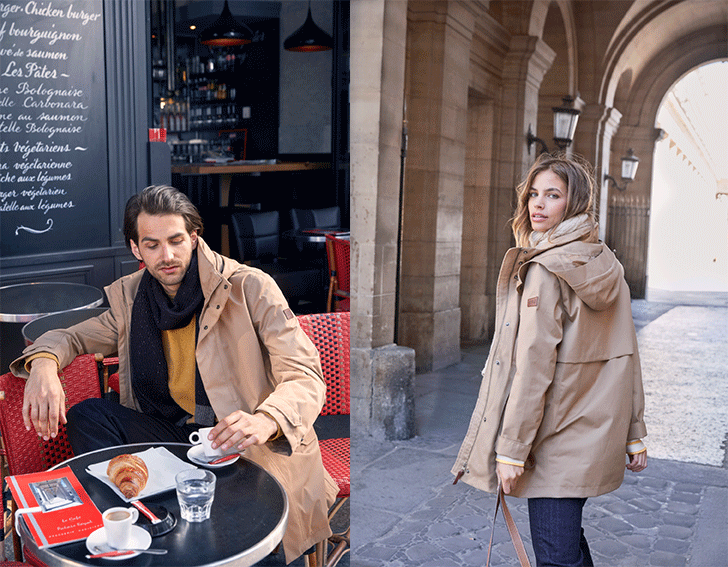 Since it was founded in 1853, AIGLE has gained renown as a brand that delivers French styles clothing in the combination of design and functionality. The brand respects the relationship between nature and human with high-quality protective gear offerings from head to toe. GORE-TEX shares similar values in supporting and encouraging each and every individual’s drive to explore life as their personal goal – over the years, GORE-TEX products have firmly established themselves as crowd favorites thanks to their waterproof, windproof, and highly breathable innovative technology. The two major brands have teamed up once again to jointly reinforce the concept – “Experience More Everyday” – as a reminder to experience and embrace life to your heart’s content. 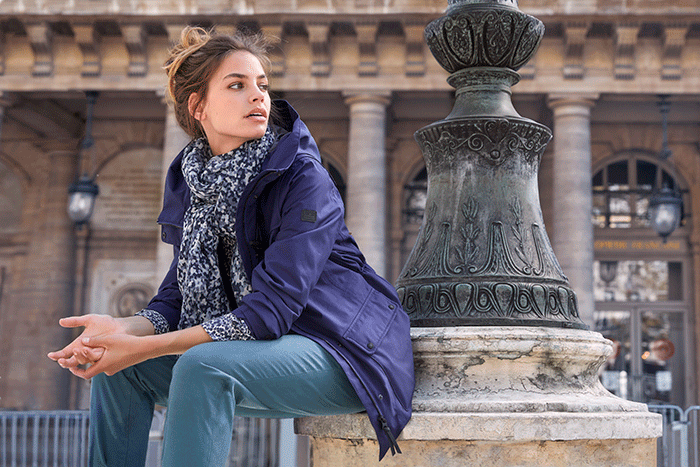 This fall, AIGLE, and GORE-TEX traveled to Paris to shoot the fall collaboration lookbook, which was set against the backdrop of the Pont-Neuf Bridge across the river Seine, the Place Dauphine, and the Palais-Royal’s fountain. Juxtaposing the travel experiences of the male and female models highlights the nature of wanderlust and the Parisian quality of je ne sais quoi, resulting in a fleeting moment of crossed paths – similar to the meeting point of AIGLE and GORE-TEX in their journey towards creating fully functional outerwear and exploring the possibilities of enhanced functionality and style. In addition to GORE-TEX’s use of waterproof, windproof and highly breathable fabric, the new MEN’s BROUMOUS and WOMEN’s BAUSSOIS GORE-TEX parkas feature a simple yet effective Thermo-Kit design. The adjustable zipper and buttons allow for a high degree of flexibility, as it allows you to seamlessly transition and adapts to changing seasons by easily attaching a fleece or down inner lining. Available in a wide selection of colours, the inner lining exudes individuality as you are free to personalize and show off your own style. This season, another highlighted womenswear parka is the DASTANET GORE-TEX. Made of a lightweight fabric and featuring a hooded waist-cut design with prominent duffle buttons on the chest, it captures the essence of AIGLE’s French aesthetic. Traveling in extremely cold weather can often hinder the enjoyment of a journey. To tackle severe weather conditions, AIGLE presents the new GORE-TEX Primaloft® outerwear series. This is the first time GORE-TEX shell fabric and Primaloft® padded lining have been paired to conquer the tough conditions. The stretch fabric by GORE-TEX improves the overall flexibility and comfort. GORE-TEX material is consistently waterproof, breathable and its insulated functions innovate in the high-performance arena. 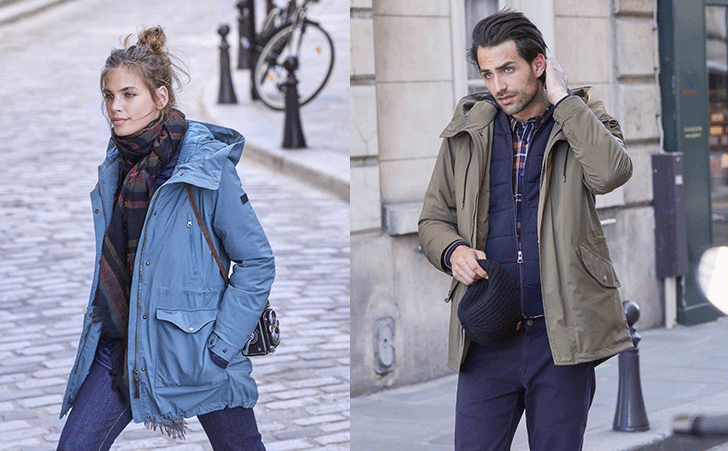 Both men’s and women’s jackets are based on the classic AIGLE fishtail parka, utilizing a flattering waist cut. The jacket was carefully designed to provide practicality – for example, it features a fitted cut, a detachable hood, multiple pockets, an adjustable drawstring, and an adjustable hem to fit your needs. The hem’s button and drawstring allow you to change the length of the jacket so you can endure volatile weather whilst keeping yourself warm. Down jackets are an essential for travel in the winter season. However, when faced with rainy and wet conditions, the down jacket’s important insulating function is greatly reduced, affecting your ability to stay warm over time. For that reason, AIGLE and GORE-TEX are proud to unveil the new lightweight LABORIAZ AS GD GORE-TEX down parka. The innovative fabric is perfectly waterproof, making the down jacket impenetrable to rain. The jacket is perfect for the cold weather as the ratio of down to feathers is 90% premium white goose down to 10% feather. It features knitted-wool wrist-cuffs for extra warmth, and unlike your typical bulky winter down jacket, this style was designed to accentuate the female waistline by using long, straight patterns and an elastic waistband. To provide overall protection, the design features a detachable synthetic fur cap, which can be detached and easily washed, giving the down jacket an elevated design and effective functionality. 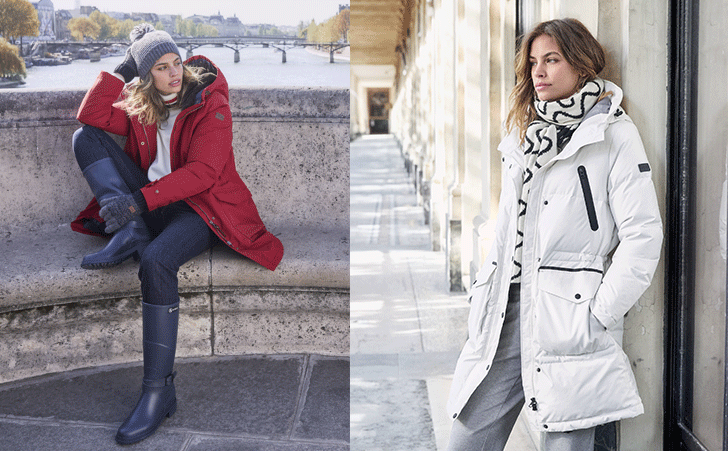 The MACLEA AS GORE WINDSTOPPER down parka was created with women in mind. The GORE WINDSTOPPER fabric is incredibly soft, lightweight, windproof and most importantly, comfortable. The water-resistant features of the fabric bring added warmth. The down jacket was designed with great detail, demanding only the best in its construction, like rubber touch details. Using the same ratio of 90/10 premium white goose down, the jacket boasts a soft inner fleece lining inside the pockets, matched with water-proofed zippers in contrasting colours. A number of considerations have been kept in mind for the everyday urban woman. It has been specially designed to fit Asian body types with a meticulously fine-tuned cut to show off their silhouettes. Besides jackets, AIGLE and GORE-TEX have partnered up to debut their footwear line, TENERE LLG GORE-TEX leather shoes. Eco Ortholite® technology, combined with GORE-TEX’s waterproof and breathable layer, translates to the insoles that are sweat-proof, breathable, anti-bacterial and absorbent. The outer layer of the shoe uses genuine leather which is highly durable and easy to style – regardless of whether you are out in the city or on holiday, these shoes are perfect anytime, anywhere. To let customers have the best protection from unstable weather. 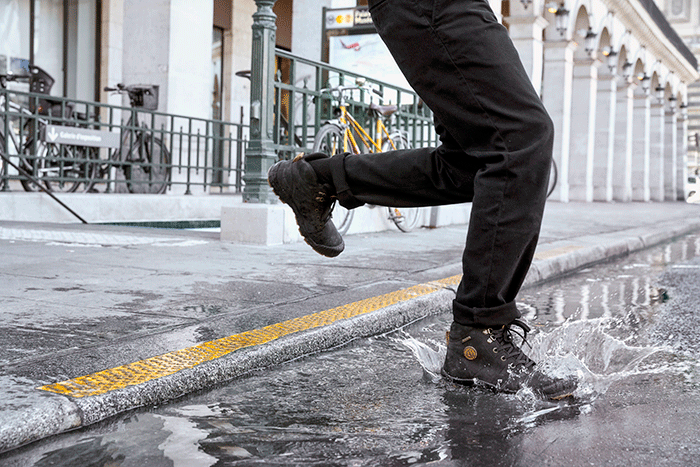 AIGLE and GORE-TEX launch a special winter promotion for all its customers. From 20th September, for every purchase at $4,800 or above with a GORE-TEX waterproof jacket, customers will get a GORE-TEX fisherman hat (with a value of $680) for free. The same 100% GORE-TEX waterproof material is used on the fisherman hat, so that it is waterproof, windproof and lightweight, providing thorough protection from head to toe functionality. 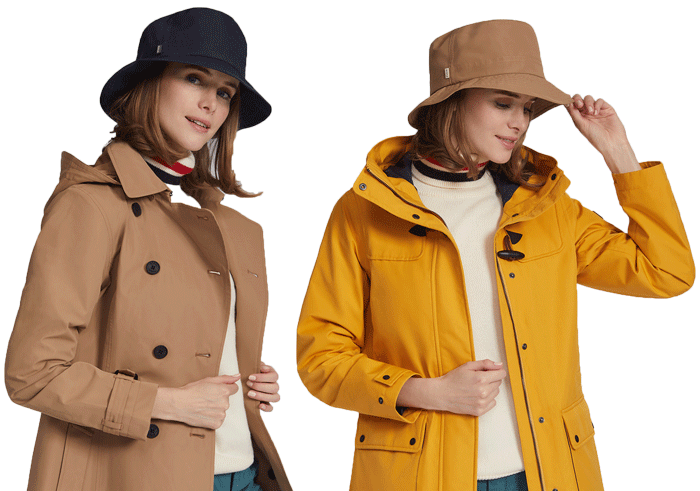 The fisherman hat offers a chic colour choice of dark navy and beige. The limited fisherman hat is first come first served so act quick!